How we started and where we are today. 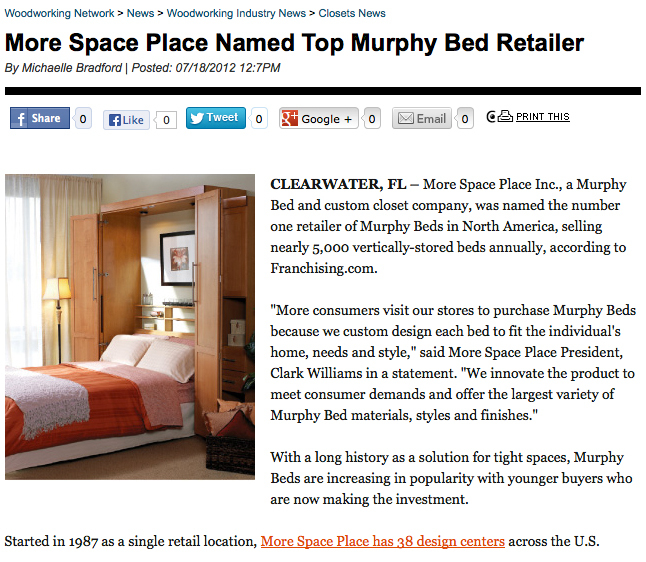 More Space Place was officially founded in 1987 as Murphy Bed Centers of America® in Jacksonville, Florida. However, you could say our vision began in 1894 in a small apartment in San Francisco. William L. Murphy wanted to invite women into his one-room apartment, and during that time society frowned upon women keeping company with bachelors in any room where a bed was in sight. So Murphy invented a bed that disappeared. More Space Place was established in 1987 as a single retail location to modernize the 1890’s concept of the Murphy bed. With seven locations and a growing space-saving furniture product line, the company officially changed its name to More Space Place in 1995. A year later, we moved our headquarters to Largo. TODAY WE ARE MURPHY BEDS AND SO MUCH MORE! Each of our stores is locally owned and operated. Here in Jacksonville, we are neighbors so we provide you with the highest level of personal assistance you expect. We’ll be there when you need us! Our technically skilled space designers utilize computer aided design (CAD) software to help bring your new project to life and to see your available options. Then our own professional installers, who work with the product every day, come to your home and install the final product.